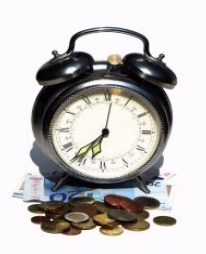 Determining how much savings for retirement you will be needing you would notice that time is of the essence. The concept of saving up for your retirement is the same as saving up for a rainy day. That is, the earlier you start saving, the more time you have to accumulate what you need for your retirement. Hence, given a specific amount of savings for your retirement, the younger we start saving, the smaller the increments that will be deducted from our regular income we receive on payday. Take this for example: you need to save up 100 Dollars for a new pair of shoes. If you start saving 20 days before the day you are going to buy the shoes, you need to come up with at least 5 Dollars a day whereas when you start saving up for the same pair of shoes 5 days before you buy them you will need to save at least 20 Dollars a day. If your daily allowance is only 10 Dollars then you will never be able to raise the 100 Dollars to go for a pair of shoes in 5 days because the most you can get out of your allowance in 5 days is 50 Dollars. The implication of the above scenario is that if you start accumulating your savings late them you have to save up bigger increments of you retirement savings goal. You are put in a position that is highly convenient. As much as you would want to save up all of your present income for your retirement, sadly it may not be feasible at all time because there are always your present day to day needs that you have to look out for. You will become anxious of not having enough savings for your retirement. In 2009, the Employee Benefit Research Institute came up with a list of average savings for retirement by age. It clearly shows that the younger you start your savings the smaller you need to cut from you present income for you savings. Another way of saying this is that the earlier you start saving, the smaller your average savings for retirement will be. Assuming you are planning to save up for the â€œaverage savings for retirementâ€ in the US at the age of 35, you need to save 6,306 US Dollars a year; 22,460 US Dollars a year when you start saving at ages 35 to 44; 43,797 US Dollars when you start saving at 45 to 54; 69,127 US Dollars when you start saving at ages 55 to 64 and 56,212 US Dollars when you start saving up at the age of 65 and older. Saving as much as 40,000 US Dollars a year can be heavy burden and the task can put a lot of pressure on you. That is certainly not the kind of life you want to lead just when you are close to retirement. The best plan would be to start saving while you are still young to keep your average savings for retirement as low as possible.